New York, NY, U.S.A.: Free Press, The, 1987, 1987. hardcover in very good condition with very good dust jacket.. Hardcover. Very Good/Very Good. Free Press, 1987. Hardcover. As New. Disclaimer:An apparently unread copy in perfect condition. Dust cover is intact; pages are clean and are not marred by notes or folds of any kind. 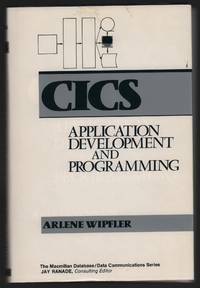 CICS: APPLICATION DEVELOPMENT AND PROGRAMMING. Macmillan Publishing Company, 1987. Hardcover. Very Good/Very Good. New York: Macmillan Publishing Company, 1987. Later printing. Hardcover. 414 pp. Good, in a very good unclipped jacket. Book has lightly bumped spine ends, a twist, and a bumped top corner on the rear board. A few pages have minimal underlining. Prior owner's name on both pastedowns and endpapers. Jacket has a bit of edge wear, faint scratches, and a trace of soil on the front panel.